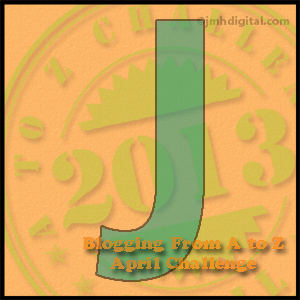 J is for Justice League… the animated series formerly aired on Cartoon Network from 2001 to 2006. I loved that series. Anyone who is a comic fan, especially DC, should give it a looksie. It continued with the characters from Batman: The Animated Series and Superman: The Animated Series. I mention that because some of the later series aired on Cartoon Network don’t share a continuity though they share characters… It’s a comics DC/Marvel thing. Just smile and nod. Anywho, I really loved that series and was sad to see it go. I loved the fact that it crossed over Static Shock and Batman Beyond. Pretty much every DC property at that time was sharing a continuity and it was fun to have guest stars. My favorite line from this episode, “You’re a credit to your people, son.” O.O!! The first time I heard that line, I just sat there. They went there. After the shock wore off, I just had to laugh. I loved the camp and the nod to the old superheroes before everyone went gritty and real. Our first introduction to the Vandal Savage character (Ra’s a Ghul can’t always be the megalomaniac bad guy). I really love this character just because of his origins and the fact that he’s the DC universe of Marvel’s Apocalypse. He isn’t malevolent. He just is. Because this is a team series, it’s hard to really focus on individual characters. It’s especially hard to focus on the one lone member without powers. This was Batman’s time to shine. I loved how he dealt with the situation. And going back and watching it again, my writer self appreciated the foreshadowing about Shiera. Vandal Savage is back! And you get to see Wonder Woman being girly… sort of. I think this has to be my second favorite episode out of the entire series. I was over the moon when DCU decided to revisit the storyline as a feature length film in Crisis on Two Earths. It’s not exactly the same but I adore both versions of this story. Evil Justice League. What’s not to love? The Death of Superman. You knew they had to do it. I would say more than this about why I loved these episodes, but for anyone who hasn’t seen the series and might decide to rectify that later, I don’t want to ruin the toy surprise. There is SOOOO much to love about this episode. Let me count the ways. That last one had me squeeing major when I realized. I love it. So much to geekgasm in this episode. Third favorite for sure. The Justice League core members as little kids. Enough said. Time travel is always a win in my book. As well, this is the episode that crossed over Batman Beyond. Instant win. This is the episode where Flash finally gets to shine and the viewing audience gets a hint as to his true power. Favorite, favorite, favorite, number one episode out of them all. I love this absolutely because it gave the Batman Beyond series a sense of closure. Not enough obviously. I still wish it had kept going but I was happy for this nugget. This is another one of those geekgasm episodes. The fact that Flash is voiced by Michael Rosenbaum, the actor who played Lex Luther in Smallville and has that scene where Lex (whose mind is in Flash’s body) takes off his mask and then says, “I have no clue who this is.” Teehee. It’s a you-had-to-be-there moment. Other than that, it’s Batman’s uber computer getting used against the JL… again. Those are all my favorites. I enjoyed the entire series and am working my way back through it again for nostalgia’s sake before I go binge The Batman. I’ve only ever seen a few episodes of that. It’s time I catch up on DC animated. I’ve never seen this, but I’m guessing my son would love it. We just finished watching the avatar series… wowza! Me and my husband loved that one too.